Please take a few moments to view this video of our Orlando landscaping projects. We apologize, but our current video does not contain any water features at this this time. So, your considering adding a water feature to your landscape and landed here looking for information. We hope to educate you a little more about water features in Orlando and Central Florida and the various types, styles, pro's and cons of each. One thing you can be sure of if you do add a water feature to your garden is that you will either be really happy that you added a water feature or really regretful of such. Please note in order for you to be a happy water feature owner you will need to ensure that your water feature is installed property without cutting corners and that you choose the proper maintenance methods to keep your water clean and enjoyable. You will first want to decide if you want a naturalized water feature, one that is meant to mimick nature, or a formal water feature such as a fountain or pondless water feature that will use a pot or statue to splash water and then collect it in a basin located below ground known as a pondless basin. One of the biggest factors that will assist you in deciding what type of water feature you will add to your garden is the availability of space. Naturalized water features will never achieve their full potential if they are not allowed ample room for planting and ample water capacity. 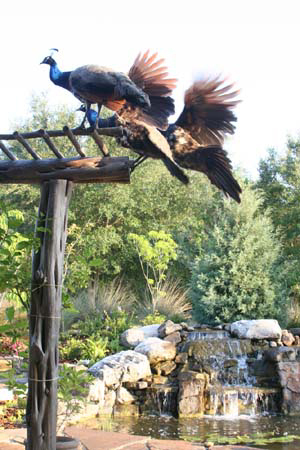 Additionally, a naturalized water feature in Orlando and central Florida will attract wildlife. If you have a fear of wildlife such as butterflies, birds, squirrells, raccoons, fish, and even an occasional peacock or several then you should probably select a formal water feature. Additionally if you will have small children around your water feature they will be intrigued and want to play in the water. Although you will need to construct a naturalized water feature with shelves to enable any living creature, including children, that may fall in to easily escape. Code of ordinance sets the required depths and shelf specifications to abide by. 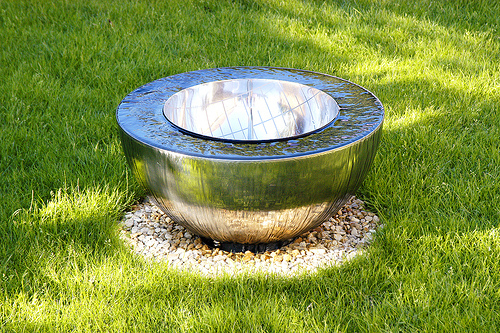 For a formal water feature the holding basin of the water is enclosed with a cover and safety is less of an issue. Now that you have decided on what type of water feature to construct you may want to consider how you will maintain your feature. Our Orlando water feature construction operations prefer to use biological filters in all of our water features to reduce the amount of chemicals required to maintain your water at healthy levels. For naturalized water features we prefer that they be maintained chemical free using the wildlife that mother nature has provided us. A biological filter will clean most of the contaminants out of your water, yet if your naturalized water feature is exposed to excessive sunlight this will enable algae to grow. To combat the algae growth we recommend mollie fish. Mollies are conisseurs of algae and require no additional food source. When you are selecting your mollies avoid the black and black specled mollies and choose the yellos, white, silver, and orange varieties. One black or speckled mollie can spoil the gene pool and eventually, they will all be black. Sure a black mollie will still consume algae, yet when viewed from above, the appear as mere sticks or debris in the water.Shall you embarq on a regiment of feeding the mollie fish, this will promote the algae growth, as you have seen the signs at the zoo and other places where fish are in captivity, Please don't feed the fish. You may encounter an excessive snail population in your naturalized water feature. Snail populations are easily reduced by introducing puffer fish into your water feature. Puffer fish have sharp teeth and will eat through your snail epidemic quite quickly. The best cure for algae is to cultivate shade, locate your water feature in a shady portion of yoru property. If you do not have shade available, there are some quick growing trees that can be planted or larger trees can be planted to provide immediate shade. Every spring expect a small algae bloom in your naturalized water feature. when the algae begins to appear simply introduce some more mollie fish into the water feature and for excessive string algae you can use a bamboo stick and twirl the string algae around it to remove the algae, being carefull not to break it up. Although koi fish are the big rage in water feature construction, we recommend that you try the mollie fish first. A koi pond will provide you with viewing pleasure, the splash and sparkle of falling water, yet are higher maintenance than a water feature with mollies. Take a trip to your local asian restaurant that may host a koi pond in its lobby, they are never sparkling clean, like a water feature that is maintained by mollies. Caution, mollie fish do three things, they eat algae, the reproduce quit readily, and they will die in very cold water temperatures. Turn off your water fall when the temperatures are forecast to go below forty degrees. This will help to conserve the ambient heat that is stored in the water. 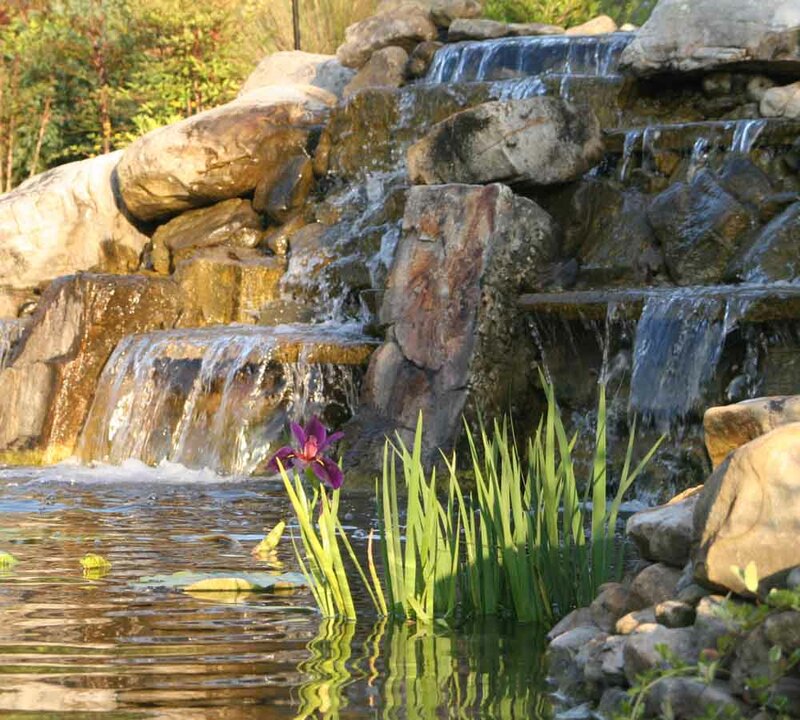 When designing your naturalized water feature you will want to keep a few tips in mind. Of coarse our landscape architect will be happy to design your planned water fall or naturalized water feature for you, yet for the do it yourself weekend warrior we offer these design tips. A naturalized water feature that truely replicates nature will need to include various sizes of natural boulders. Man made or concrete boulders will face over time and never truely replicate nature, in the beginning you might convince yourself that it looks ok, but over time you will realize the need for a remodel to remove the artifical boulders. Additionally, mossy boulders work best, a boulder that has been power washed to remove any lichen or moss growth is sterile and cold in appearance, remember, boulders are millions of years old and mother nature doesnt power wash them in a natural stream. Use various sizes of boulders to obtain the best appearance, you will need a machine to move the larger boulders yet without large boulders, you are not creating a true reflection of a natural water feature. When you are selecting your gravel and stones to cover your poly liner with make sure you use rounded river rock. Chipped stone will puncture your Orlando water feature liner. Additionally, ensure that you are using an automatic fill mechanism to compensate for the evaporation of water. You may not realize but in Orlando Florida the average weekly evaporation from a water feature or pool is 1.25". Shall you opt for the more formal appearance of a fountain or pondless water feature for your Orlando garden you will be quite pleased with the vast selection of options that are available. There are many colors, shapes and sizes of fountains and decorative water jars available for this type of application. Please note that some manufacturers may refer to a pondless water feature with a decorative pot or water jar as a crucible fountain, no worry, you are speakign about the same item. Shall you decide on a fountain keep in mind there are typically two types of fountains for residential water feature use to us here in Orlando. A self-contained fountain will have a basin, pump, and the decorative water fountian all in one kit. These are typically place, fill and plug kits. As these self contained water fountains typically do not have a provision for an auto fill mechanism you will need to rely on yourself to replace the water loss. A fountain that requires a basin typically involves a detailed installation procedure, sometimes requiring a pool builder to install, construct and seal the basin agains water leakage. 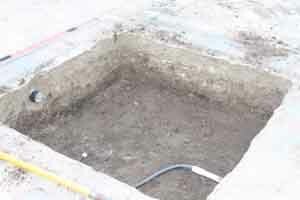 The decorative fountain element is then placed on a pedestal that is provided and conceals the pumping mechanism. 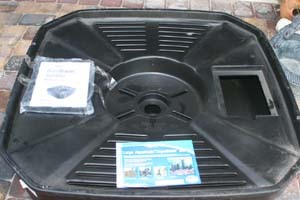 These basin style fountains can have an auto-fill mechanism installed by the pool builder. A pondless water feature is best described as a hybrid between a self-contained fountain and a fountain and basin arrangement. The pondless basin is a molded plastic insert that is recessed into a hole in the ground, this pondless basin will come with holes and attachments for an auto fill mechanism. You will need to order the auto-fill seperately as it is an option that will not come with your kit. You will need to select a decorative pot or water jar and seal the inside if it is exposed unfired clay. A sealer that is dark in color will provide a highly reflective surface to the water. One thing to keep in mind when deciding whether to tackle your Orlando water feature project yourself or to hire a qualified water feature contractor is trade or wholesale pricing. All of the vendors that you will be dealign with will be charging you retail pricing for your water feature components, materials, boulders, natural stone, etc. Qualified water features such as Landscapes by Land Art receive wholesale pricing for higher quality products. The money that you perceive that you are saving in labor by breaking your back to construct your water feature with inadequate equipment may not be as much as you think. As our Orlando water feature construction crews are experienced at building all types of water features our labor is efficient and the water feature that you receive is professionally constructed with no mistakes.